In the midst of setting new trends and bringing stars together in the Big Apple, this season's New York Fashion Week packed a few powerful punches. Much like a back to school routine, celebrities, style mavens and industry figures put their most stylish foot forward and gathered at various locations throughout New York City to take in the spring-summer 2019 shows. However, in the mix of all the usual pomp and circumstance, it was clear that some designers were interested in making statements beyond style. Brands like Chromat, Christian Siriano, Jeremy Scott, Brandon Maxwell and more invited their crowds in for shows that, in some way or another, pushed the boundaries of what is typically found in all corners of NYC's biannual affair. For some showings, that meant expanding the range of sizes walking the runway. For others, a political message was the pièce de résistance. 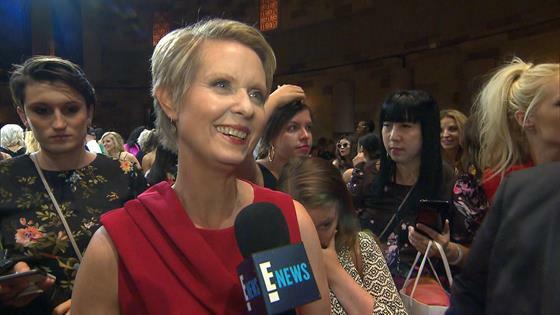 "He's been such a supporter of the campaign, which I've been so honored by and so grateful for," New York gubernatorial candidate Cynthia Nixon told E! News of Siriano, who sported a shirt that read "I'm Voting for Cynthia" down his runway on Saturday. "It was an incredible tribute, but it's a natural fit because he's been a designer that has so much been a champion for so long of [the message] that fashion should be for everybody." Meanwhile, Nixon was among the most unexpected, but appreciated front row guests of the season as she sat beside Whoopi Goldberg at Siriano's event. While not every designer has fully embraced inclusivity or diversity in their shows, others like Siriano continue to practice what they preach no matter who is following along. Though there's always room for more progress in the seasons to come, there were some instances this time around when an extra round of applause was necessary. At Rihanna's first Savage X Fenty fashion show on Wednesday, the star made it clear that every woman is an important part of her world as models of all different body shapes and ethnicities as well as some expectant models proudly sported her lingerie designs—together. While the fashion world continues to grapple with how to be more inclusive and representative of all consumers, Chromat's Becca McCharen-Tran once again put some designers' excuses to shame as she seamlessly showcased models of different experiences, sizes, ethnicities, ages, genders and with disabilities on her runway as has been the norm for the brand season after season. She further tackled feeling like an outcast with Chromat's thesis statement of sorts for the new collection, which was inspired by wet T-shirts: "We wanted to reclaim the experience of hiding under a giant T-shirt at a pool party (when ur too embarrassed to be seen in swim) and make it a garment to wear proudly." For breast cancer survivor Ericka Hart, who had the opportunity to proudly sport her mastectomy scars on the runway once again, it was a appreciated opportunity. "Put breast cancer survivors in spaces that have nothing to do with breast cancer," she wrote on social media. Time for the rest of the fashion world to step it up. A baby bump was among the different beautiful shapes on the runways this fashion week. Longtime model Lily Aldridge strutted in Brandon Maxwell's Saturday show while five months pregnant with her and husband Caleb Followill's second child. "I've walked few runways in my life and this is a moment that I'll look back on forever with great emotion," Aldridge wrote on social media. "It was so much fun being backstage will all the girls, everyone was so uplifting and rubbing my belly celebrating this beautiful journey with me Nothing but Empowerment at Brandon Maxwell." Needless to say, the moment perfectly encapsulated women's endless juggling act. New York Fashion Week is all about making a statement and this season—it was a political one. Christian Siriano and Jeremy Scott raised their voices and incorporated their own messages into their shows. For Siriano, that meant expressing support for New York gubernatorial candidate Cynthia Nixon. In addition to sending a model down the runway wearing a black T-shirt that read, "Vote for Cynthia," he also rocked one himself (it read "I'm Voting for Cynthia") as he made his finale walk. Meanwhile, Scott focused on protesting Supreme Court nominee Brett Kavanaugh. "Tell your senator no on Kavanaugh," his T-shirt read, along with a telephone number. "Women's rights, reproductive rights, LGBT rights, affirmative action—you know, it's all at stake with this one man," the designer told the AP (via Marie Claire). No matter what their messages were, it was empowering to know they had the freedom to express them. There were several significant takeaways from Chromat's spring-summer 2019 show, but one of the most clear ones was the "sample size" T-shirt a handful of models finished the show wearing. While the women were not "sample size" by the industry's longtime standards, that was entirely the point. In Chromat's vision, they absolutely were. "'Sample sizing' tends to be an excuse that other designers cite as a reason why they don't feature a range of sizes in their runway shows. At #Chromat, we know that the designer has the power to choose what size they prototype their collection in," Chromat's social media account read. "Our goal is to encourage more designers to sample their collections in a range of sizes, in order to celebrate all different size bodies on the runway." Model Sonny Turner, who wore one of the shirts, couldn't have agreed more. As she wrote online, "BEING YOURSELF IS THE NEW SAMPLE SIZE RATHER THAN BEATING YOURSELF UP IF YOU DONT FIT INTO SIZE 0." It's not every day a designer's grandmother walks the runway, but it was a very good day when designer Brandon Maxwell's "Mammaw" did for his latest show on Saturday night. The style savant accompanied his beloved grandmother, 81-year-old Louise Johnson, down the catwalk for his most recent showing as she donned a vibrant red pantsuit of his own design. This isn't the first time Maxwell has honored Johnson—she also starred in his Fall 2018 campaign. "I just thought right now, I'm in a place in my life where I'm thinking a lot about who I am and where I'm from and what made me who I am, and very core to that story obviously is my grandmother," he previously told Glamour. "I grew up in a clothing store with her—under a clothing rack, under the cash register…. She really pushed me to do what I do today. And I think that there's no better way to honor that than giving her that space." A round of applause for Louise! While plus size models have not yet become a standard of every catwalk, several designers once again included women of different sizes in their shows at this season's New York Fashion Week. Such brands included Christian Siriano, Prabal Gurung, Cushnie et Ochs and Chromat. As Candice Huffine, who proudly flicked her Siriano lime green scarf cape into the air on the runway, wrote on social media, "Carpe Diem, butterfly. Thank you @csiriano for another spectacular, glamorous, inclusive, gorgeous experience!!"